In maritime activities and naval forces, rapid, reliable and durable technology is mission critical. Winmate's Marine series products feature industrial-grade design and undergo rigorous testing, going beyond military standard compliance, to ensure safety and performance. 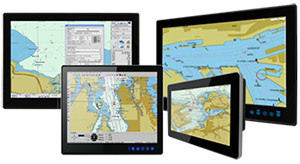 The newly designed Marine Panel PC, Display and EAC Box delivers connectivity, and the ability to control and power multiple devices at once, while meeting marine equipment standards IEC 60945, DNV 2.4, and IACS-E10 (international standard for maritime navigation and radio communications equipment and systems). DET NORSKE VERITAS (DNV) is an autonomous and independent foundation with the objectives of safeguarding life, property and the environment at sea and on shore. DNV certification related to quality of ships, offshore units and installations of the system and components. DNV Requirements are harmonized with IACS Unified Requirements E10 and IEC publication 60945.
International Association of Classification Societies (IACS) is an organization that provides technical support and guidance for promoting the safety of life, property and the environment through the verification of compliance with technical and engineering standards for the design, construction and life-cycle maintenance of ships, offshore units and other marine-related facilities. Equipment wished to be use in navigation and radio communication systems is to comply with IEC Publication No. 60945, "Maritime navigation and radio communication equipment and systems – General Requirements- Method of testing and required test results". 10.4", 12.1", 15", 17", 19", 24"
10.4", 12.1", 15", 17", 19", 23", 24"